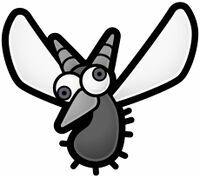 Jabbies are gray, mosquito-like insects that live in the Great Tree alongside the Punies. The Jabbies ally themselves with the X-Nauts in order to gain control of the tree. In the second chapter of Paper Mario: The Thousand-Year Door, Mario and his friends must save the Punies from the Jabbies. Mario and the Puni army following him wage a short war on two of the Jabbi hives. After the chapter, the Jabbies learn to live in peace with the Punies. The only Jabbi whose name is known is Jabble, whom Punio says used to be his friend, and he wonders if Jabble is involved in the alliance with the X-Nauts. It is proven that he is not if the player uses Madame Flurrie to find the secret store in which he is located. Inside the Great Tree, after the completion of the chapter, there is a room where a Jabbi is hidden in a bush. If shaken, the Jabbi appears and gives Mario a Mushroom. Tattling it before talking to it reveals that this Jabbi is Jabble. This page was last edited on August 21, 2017, at 05:08.